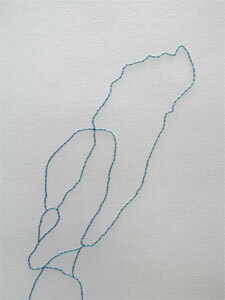 Why a stitched line versus drawing with a pen or pencil? Process. The act of stitching. A conscious slowing down. The sound of the needle puncturing the paper creates a rhythm, a meditation. My thread drawing series has continued to evolve as I investigate line through trails, roads, routes and paths that I walk and drive.